My first REAL run in a very long time. Both the dog and I were grateful for the sunshine, and I was particularly glad of the hit out. So far it’s been a great day. I will be doing a quick 20 minutes on the bike tonight while the kids are eating dinner, (which will also stop me from picking at their plates). The challenge will be dinnertime – so I’m committing right now, online, to a vegetable omelette with grainy bread. 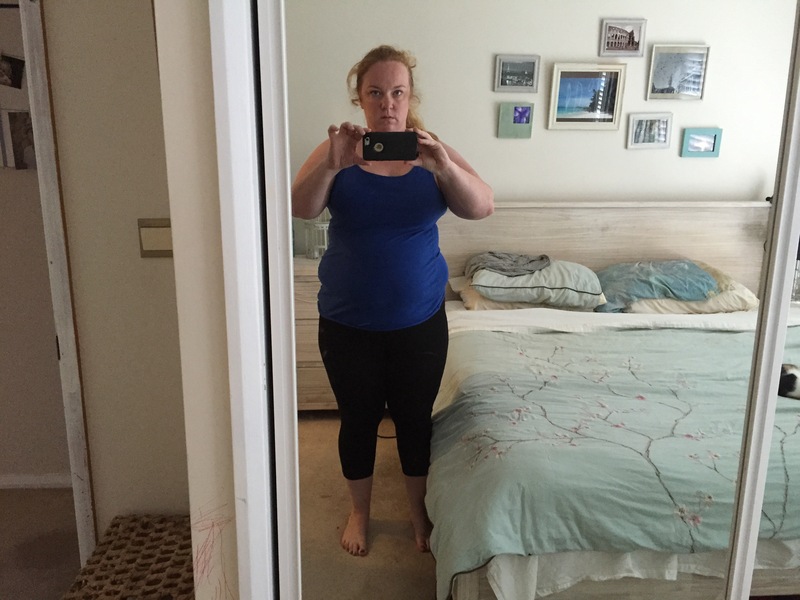 I’m setting myself a goal – just under 5 weeks until we go to Fiji, (another challenge, but we’ll get to that), and I want to be 5kgs down. That’s a whopping 38,500 calorie deficit I’m chasing. 32,715 to go. My new best fitness friend. Now that I am setting more tangible shorter term goals, I have decided to get serious and I’ve made a serious investment. This little baby is my new best friend, and only comes off my wrist either to charge or in this case, to take a picture. I firmly believe that weight loss is as much about clever planning as it is about motivation, and this allows me to keep track of all my fitness goals. 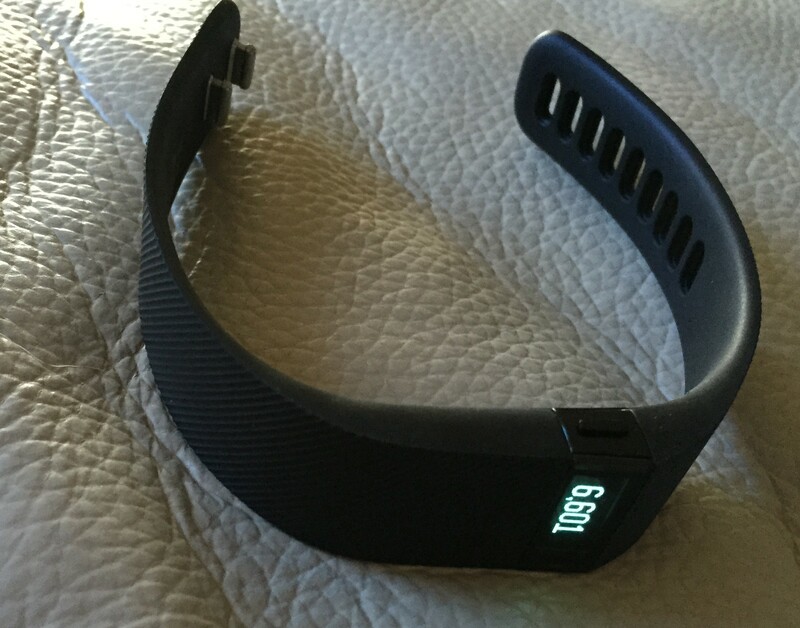 It tracks weight, (if you’re into that), sleep, calories in, calories out, steps, and water consumption. So at any point during the day I can use this gadget as part of my decision making process – can I really afford that Paddle Pop after dinner? Let’s see what the fitness tracker says. Can I afford to use up 70 more calories today and still reach my daily caloric intake goals? Genius. And my new best friend. Love letter from my new best friend. The display to the right is from my phone, so I will be able to post daily progress updates very easily. Huzzah! Today was excursion day, and so I accompanied 100 five and six year olds to the Aquarium. No small feat, and very little time (or leftover energy) for a workout. So I was completely reliant on solid diet decision making and as much incidental exercise as possible to get the job done. 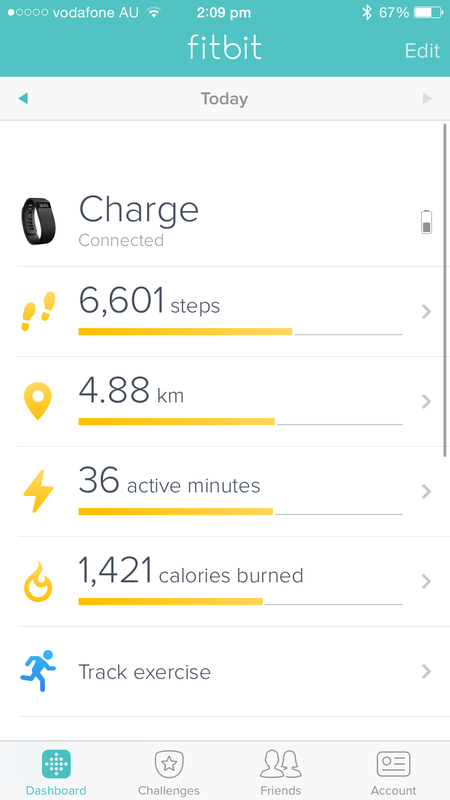 Though it may not show in the estimated calorie count, today I took 14,032 steps. In reality, that will help burn more calories and reach my goals. Also, I still managed a great breakfast and dinner, and that is always a good foundation for a great weight loss day! [The] “little by little” cumulative effect is the key to incidental exercise. Add this extra activity to some of the classic informal exercise regimens, such as taking the stairs instead of the lift or getting off the bus one stop earlier, and you can be well on your way to surprising fitness improvement and weight loss. Even if you do three weekly gym sessions, that’s only three hours a week, with possibly not much other activity in the remaining 165 hours. In contrast, informal exercise could be part of your every waking moment. Instead of looking for the closest car park to the shops, be content to park further away. Not only will you find it easier to get a park, you will also get in a few minutes extra walking to and from the car. Leave the car behind if you’re only going a short distance – most people can walk 1-2 km quite easily. Go to the park and play with the kids after school – either push them on the swings (good for upper body strengthening), play ‘tag’ or throw around a ball. Get enthusiastic about the housework – turn on some music and have a dance around the house while you are vacuuming or sweeping. Dig around in the garden, weed and mow the lawn on the weekend. Take the stairs instead of the elevator in shopping malls, or walk up and down the escalators rather than waiting for them to deliver you to the next shopping level. Get up to change the channel on the television or the volume on your stereo, rather than using the remote. Dr Bill Sukala discusses and references the research here – an article well worth reading. None today, but back with a vengeance tomorrow! Paella for dinner full of fresh vegetables. What an amazing run! I actually had the energy to extend my legs out and pick up a fair bit of speed, knocking 7 minutes off my run time from Monday. There were still a couple of breaks, (mostly for coughing fits, which still happen when my respiratory rate is significantly increased. I’ve internally coined them ‘coughie’ breaks, though they only last a few seconds.) And the best news is I’ve lost more than 7,700 calories – 1 kilo down! So far, the lifestyle changes I have made to my diet are going well. I’ve come to look forward to my breakfasts and am taking special pleasure in cooking healthful dinners. I have spent a lot of time discussing exercise habits so far but diet is equally important – depending on the starting point for a particular person who wishes to lose weight, it could be more so. 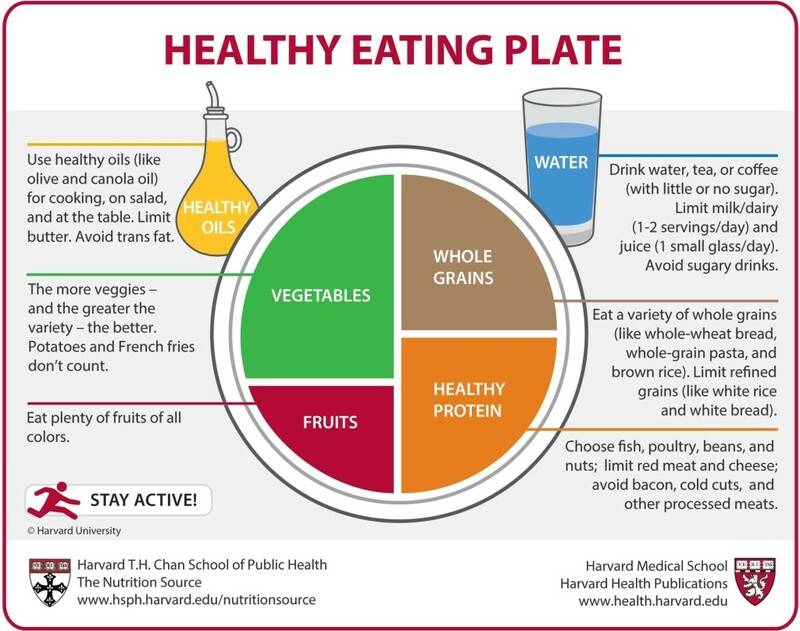 Using Harvard’s Healthy Eating Plate as a guide, we recommend eating mostly vegetables, fruit, and whole grains, healthy fats, and healthy proteins. We suggest drinking water instead of sugary beverages, and we also address common dietary concerns such as salt and sodium,vitamins, and alcohol. It’s also important to stay active and maintain a healthy weight. It was created by a team of nutrition experts at Harvard, and provides a pretty good common sense guide to what a healthy diet looks like. Of course, there’s the issue of how much food we should be eating from the Harvard Plate – portion size is key to weight loss and I’ll delve into the research tomorrow. Just a quick run this morning and then a quick bike ride tonight. We are heading off for a long weekend tomorrow and I have a lot to do. Today I have eaten well and fit in exercise where I have needed to – it’s not perfect, but neither is life and at the end of the day I am still on the right side of the calorie count. It might be a good opportunity to fill in some specifics of how I am burning excess calories. I thrive on routine – in fact I think successful weight loss is dependant on it. Routine means I don’t have to think about what I am going to eat or which workout I will be doing, I just have to follow the plan. There may come a time where I need to moderate the plan, and of course extraordinary events like dinners and weekends away will mean I need to make good decisions when I can’t follow the plan. But for now it is working. I exercise at least once every weekday. Right now I am running daily with my dog and often doing a second workout at night. Sometimes this is a twenty minute bike ride while I reheat dinner and catch up on reality television. Other days it is more intense. In total I try and do a minimum of one hour of exercise per day. On Thursdays and Friday nights I train with my friend and trainer Luis. He has been training me for years and is great at his job. Those sessions resemble a sort of HIIT training, (High Intensity Intervals). They are easily replicatable if he is away, but at the end of the week I thrive on the extra motivation. It’s nice not to be making the decisions for a while. For those following at home any kind of high intensity workout – pump class, skin class, Tai Bo, intervals at home or your own gym workout that mixes cardio and resistance would fit the bill. Weekends I have off dedicated exercise sessions but I try and stay active and concentrate not eh number of steps I take hitting at least 10,000. This is surprisingly easy following two children around. 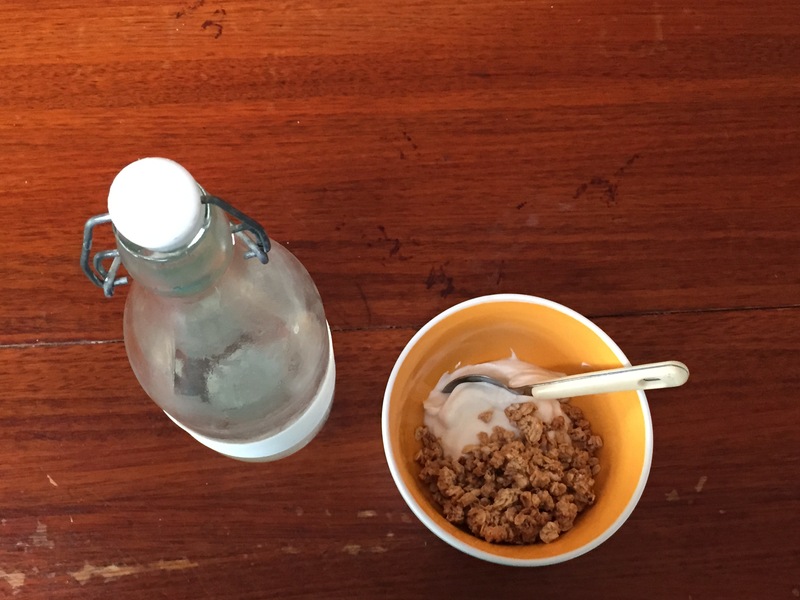 7am – Half a protein bar, fruit bar or muesli bar. Around 150 calories total. Piece of fruit, (banana or apple). Up to 50 calories. Huge glass of cold water. Three table spoons of full fat vanilla yoghurt, (no added sugar). 100 calories. Three table spoons of oats and a sprinkle of dried fruit. 100 calories. Handful of berries. Up to 50 calories. 1pm – Frozen dinner. I love Lean Cuisine Lamb Kofta or Weight Watchers Chicken and Vegetable Risotto. Both are less than 350 calories. Handful of nuts. Up to 100 calories. 4pm – Carrot, capsicum and celery sticks with tatziki or hummus. 200 calories. Piece of fruit (banana or apple). Up to 50 calories. Bulla Ice Cream. 180 calories. TOTAL APPROXIMATE CALORIC INTAKE – 1780. My dinner options are different each night, which allows me to get a bit of variety. About 3-4 nights a week I will have either an omelette with vegetables or home made baked beans on grainy toast. Other nights I calorie count a portion of what the kids have. 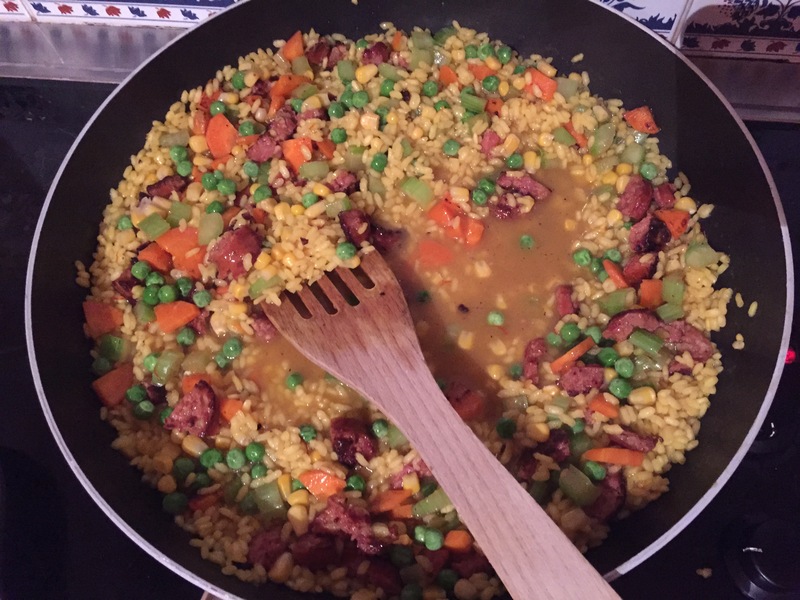 I have about twenty different meals I cook for the kids, (all are either slow cooked or very quick to make), but the ones that are easiest to calorie count are homemade soup, minestrone, paella, and prawns or fish. There are a few issues with this diet. First, I am having a Coke Zero and an ice cream for dessert daily. It’s not ideal, but I do look forward to it each day as my treat. Second, fresh food is always optimal and for lunch I am opting for frozen. I have carefully scoured the nutritional information of these frozen options for salt and additives and have chosen the best few options for the optimal caloric intake, (and of course, the best tasting). Finally, I am only just scraping into 1800 calories per day on my plan, and I don’t want to go too far under that number on a regular basis. Eating relatively well, you instantly begin eating less calorie dense food and it becomes more difficult to reach that magic number. Going under it too frequently, I would risk impacting my basal metabolic rate negatively. So I will need to be conscious of eating each meal as I have planned it. This is actually not hard once in a routine. This diet will evolve as I gradually improve my lifestyle. Again, it’s not perfect, but it works for now. This weight loss model I have created for myself relies heavily on calorie counting. I am not religious about counting each single calorie but I always know the value of what I am putting into my body. If I can’t count it, I can’t eat it. Most things are easy to figure out using a counting app, (or on a fitness tracker), and once I know them I don’t have to count them again which is another reason that routine works well. Some are more challenging, particularly if I go for a coffee or a quick meal. For example, If I were to eat a serve of Lasagne from a restaurant I could look up its calorie count, but the reality is it would vary significantly depending on the cut of meat, the amount of creme used in the béchamel sauce and the portion size. This means I naturally limit the amount I eat out, (again this will be challenged this coming weekend away), and I am forced to make better choices when I do go out. A portion of salmon is easier to count, (and much better for me), than that slice of lasagne. Calorie counting only works if I understand portion control, and in todays super sized world that can be challenging. The Australian Government details a great deal of information about portion sizes at eat.gov.au, and even better, there is a list of what a portion of food should look like with specific examples here. Once this is known and understood, it makes calorie counting a lot easier and more accurate. Calorie counting isn’t just about counting each morsel that goes into your mouth, its about eating mindfully and knowing what you are putting into your body. ← What’s Wrong With Jazz Hands Anyway?